Merida x Jack. Do 당신 guys ship Jarida? It's my OTP. Though I do like Meripunzel and BlackIce as well, these two are my 아기 <33 And I'm starting to hate Jack less! Yay!. Wallpaper and background images in the Rise of the 겨울왕국 메리다와 마법의 숲 라푼젤 용 club tagged: photo merida jack brave rise of the guardians 2012 jarida otp. whats so good about jackunzel that everyone likes. Jackunzel isnt going to stay popular forever because jelsa and jarida are becoming bigger. 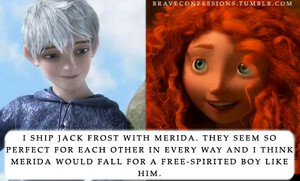 No but i think it's super cute and i understand where shippers are coming from :)The thing that stops me from shipping it is the fact that I see them as adorable rivals and can't see them in a love-hate relationship.Btw my OTP is hicanna which Im sure none of you have ever heard of before.Jackunzel and Janna are a close second.